While Vosk sings this line in character, referencing the young hopeful’s prophesied performance alongside ‪the Wonderful Wizard of Oz, there’s no denying the same can be said of her own illustrious life and career, not the least of which solidifies the foretelling assertion like her vivaciously vibrant new album, Wild and Free. Fusing pop, rock, folk, and both classical and contemporary musical theatre, the disc, off the stalwart Broadway Records label, offers a deliciously addictive compilation of melodies, each of which blends together to showcase Vosk’s transcendent vocal versatility in all the best ways. The story of a girl who — spurred on by a million dreams — makes the definitive decision to “get back to her plow” and venture “beyond the yellow brick road” of investor relations toward the beckoning bright lights of Broadway for which she was unmistakably born. The story of a girl who hits a few roadblocks and, like Waitress’ Jenna, buries her uncertainties in baked goods as a means of finding a way out. The story of a girl who’s drowning in self-doubt and, desperate to “get her feet back on the ground,” convinces herself she’ll find the salvation she seeks in the arms of a mate. The story of a girl lost in love, whose innocent attempt at flirtation via roller skates escalates into an intense infatuation from which she’s unable to escape, eternally transfixed by his hypnotic “music that makes [her] dance,” an obsession which lingers long after a supposed split upon the realization that he cannot, in fact, give her all that she needs. But ultimately, it’s a story of self-discovery, self-worth and, perhaps as a result of the earlier trauma, the recognition, amid a road wracked with rough patches both personally and professionally, that acceptance does not and cannot come from an “other”; it must come from within and we must look out for ourselves — after all, “nobody’s on nobody’s side. As she relaxes into that mindset, she’s instantly transformed, swingin’ from a chandelier and soakin’ up not only the present moment itself, but the relief that stems from the surrender, and the realization that once you accept your circumstances for what they really are, nothing else really matters. Of course, with that said, we’re not entirely perfect, and we may not have all the elements of our stories figured out — continually assembling the pieces in the puzzle of life as we go along — but again, as Vosk relays, that’s okay. She herself admits she’s still piecing it all together, but having “woke the f*ck up” to the idea that she can cast aside judgment and live freely in her own skin, she’s embraced the fact, as the album exemplifies, that being “perfectly incomplete” can actually be pretty damn spectacular. You just have to believe that it can be. Thus, having come to this conclusion and found inner peace and prosperity in her own right, she’s now spreading her wisdom over an assortment of 14 tracks, all brilliantly bundled together into one splendiferously pink package. And sure, the revelation may have taken a bit longer than she thought, the yellow brick road not paved as smoothly as she had imagined, but you can bet, having emerged on the other side, Vosk is reveling in it all, wholeheartedly reaping its benefits. She’s flying high, defying gravity. Her future is truly unlimited. At long last, she’s finally... blissfully... gloriously... wild and free. And nobody is ever gonna bring her down. 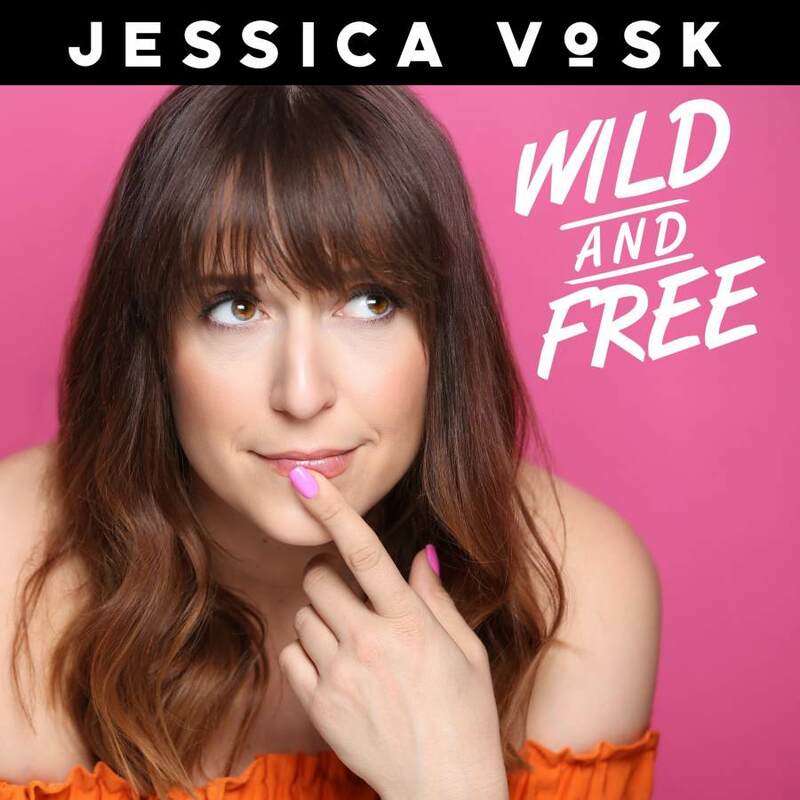 Jessica Vosk: Wild and Free was released in August 2018, and is now available on all music platforms. Wicked currently plays the Gershwin Theatre (222 W. 51st Street). For more information, visit www.broadwayrecords.com, www.jessicavosk.com and/or www.wickedthemusical.com.